April 8, 2010 – Guru Studio’s HAZED, an animated black comedy with an underhanded environmental message, was selected for the Pictoplasma Characters in Motion Film Festival in Berlin. The short film, produced by Toronto-based Guru Studio (gurustudio.com), is slated to screen April 10 as part of the two-day festival celebrating the very best of contemporary character design in motion. Director Matt Hammill initially created the film as his Sheridan College thesis project. HAZED has screened internationally at the Ottawa International Animation Festival, the Animation Block Party in Brooklyn and the OneDotZero Adventures in Motion Film Festival in London, among many others. The comical short film was one of two chosen for PBS’s Reel 13 Shorts, a weekly online competition. It has gone on to win numerous awards, including Best Use of Animation at the Telly Awards and the Platinum Pixie Award for Outstanding Creativity in Animation, Motion Graphics and Effects. The film features a naïve, smoke-spewing factory that suddenly becomes appalled and guilt-ridden over the toxic side-effects of his existence. 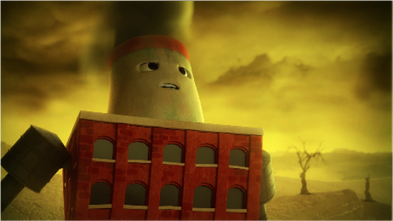 The factory comes to the bleak realization that he must choose between his own survival and the survival of the planet. Hazed is as much a playful commentary on the serious impact of pollution as it is a reflection on the compulsive nature of humans. The film’s trailer can be viewed at www.gurustudio.com/hazed/. Celebrating its 10th year as an animation industry leader, Guru Studio (www.gurustudio.com) was founded in 2000 with a mandate to create the best and most innovative animated entertainment. The company has recently undergone a dynamic period of growth to become a diversified creative content producer and service provider that is focused on developing unique concept-driven screen based properties. Pictoplasma (www.berlin.festival.pictoplasma.com\)is a contemporary character design and art festival. It features a diverse lineup of artists, including directors, designers, and agencies, who participate in a full weekend of character-centric lectures, artist talks, and animation screenings. Selected work ranges from music visuals, motion graphics, narrative shorts and experimental animation. This entry was posted on Monday, April 12th, 2010 at 8:34 am	and is filed under News, Uncategorized. You can follow any responses to this entry through the RSS 2.0 feed.